Wonder Woman in Batman vs Superman: Dawn of Justice — How Did They Do? Eight Minutes to Reach the Sun? Orpheus Ascended From Hell …. Remember You Were There …. This issue, we interview Svartesól, the founder of Gullinbursti Press and editor (and primary author) of Visions of Vanaheim. Svartesól discusses the differences between Asatru and Vanatru, and why the path of the Vanatruar is so important today. She also offers some advice to would-be self-publishers …. Eternal Haunted Summer: If you could correct one misconception about modern Paganism, what would it be? Svartesól: Just one? I would say the one that is most important to me is that we are not all rebellious overgrown teenagers trying to ‘freak the mundanes.’ Most of the Pagans that I have met over the years are very serious in their beliefs and practices, and devoted to their Gods and Goddesses. EHS: How would you describe Vanatru to someone who was completely unfamiliar with that path? S: In a nutshell, Vanatru is a branch of Germanic Paganism which focuses primarily (and in some cases, exclusively) on the Vanir. The Vanir are the northern European Deities of nature, and by extension the prosperity from land and sea and the fullness of life that comes from living in a right relationship with the land. Those who identify themselves as Vanatru may have variances of belief and practice, but the one thing we can all agree on is that the Vanir are important — that They call to us primarily — and there is a need to explore Their ways of doing and being. EHS: What can we learn from the Vanir today, in the twenty-first century? What value lies in following the path of a Vanatruar? S: To worship the Vanir is to worship the Powers of the land itself. Our Gods are not ‘up there’ or ‘out there,’ but are ever present in the air we breathe, the water we drink, the flora and fauna around us. To disrespect the land is to disrespect the Vanir. More than any time in history, we live in danger. We have the technology to destroy our planet and ourselves. Thus, some of us are involved in environmental activism of some kind. Some of us are more quiet about it and we do what we can — recycle, garden, pick up litter, live more frugally and simply outside of the consumerist lifestyle. A few of us are homesteaders or aspire to be homesteaders eventually. To truly honour the Vanir is not just to invoke Them and give Them offerings, but means truly honouring and respecting who and what They are. And that means acknowledging our interconnectedness and interdependence with the land and everything that is on it. People don’t want to intentionally foul their nest, so to speak, but most do so unintentionally. In these crazy times, there are ecological disasters — like the oil spill current at the time of this interview — and escalating violence. We live in a society where we use each other, and where nature is seen as ‘here for our enjoyment’ or (worse) ‘resources.’ We take and take and take. This has caused an imbalance, to put it mildly. The Vanir can teach us how to live with more respect and reverence for life. Most of us need all the help we can get. In keeping with respect and reverence for life, the value in being Vanatru is to find gratitude for the gift of life itself, and to live the best you can with what you’ve got, as an expression of that gratitude. There does not need to be some grand esoteric purpose to existence. It is sacred enough that we exist. Each of us has a place in the world. It is important to find joy in each day, and to remember that no matter what else is happening — whether there is war, or disease — there is also still beauty in the world. Life is still worth living. Many are losing hope; the Vanir can give us hope. The Vanir can give us a home. So even though we are no longer living in the era where the Vanir initially contacted humanity, we need Them now more than ever. Reading Visions of Vanaheim will not change the world. But each person who communes with the Vanir can live well with their own corner of the world. That is what matters. EHS: For you, what are the major characteristics which distinguish Vanatru from Asatru? S: Besides a focus on the Vanir rather than the Aesir, or an Aesir-Vanir blended path, I would have to say, based on observation, that the biggest defining characteristic is that most of the Asatruar I’ve talked with feel their religion is a community-oriented (and thus people-focused) one. Most of the Vanatruar I’ve talked with feel our religion is an earth-centered one. Finally, I would say that Asatru tends to focus on lore and study, and Vanatru seems to have more of an emphasis on intuition and hands-on experience. This isn’t to say these are mutually exclusive, but most people express themselves religiously through one more than the other. In Asatru there is an emphasis on reconstructing the practices of the ancient Germanic people. Some Vanatruar are reconstructionists, but a surprising number of us — myself included — are Witches and/or Druids, and feel these modalities fit the Vanir and Their values and how They desire to be worshipped, much better. If you meet someone who identifies as Vanatru, there’s a chance they may be a reconstructionist, and it’s just as likely they won’t be. EHS: Visions of Vanaheim focuses on the Vanir tribe of Northern Deities. Why a book about Vanatru and the Vanir? S: Because there is nothing else like it out there. I wanted to write something that would have helped me back in 2006 when I saw the word ‘Vanatru’ for the first time. It resonated with me, because I was working with the Vanir and could not really connect with the Aesir, and was told by some Heathen friends ‘that’s not a real religion.’ During those days of seeking, I did find Thorsson’s book, Witchdom of the True, and while it gets points for effort, it was awash in too much esoterica to be helpful. So I thought there was a need for a practical workbook for getting to know the Vanir and live according to Vanic values, and I wanted to ‘pay forward’ my research and experience to those who can benefit from it. EHS: What kind of research went into Visions of Vanaheim? Did you have a big stack of books? Discussions? Personal experience? S: For the ‘Northern Tradition Timeline’, my partner and I did an insane amount of research, both online and in various books. We talked a lot about what we found. The Deity sections were based in research of the Eddas and Sagas and other primary sources, as well as historical materials and some folklore. And a lot of it was indeed based in personal experience, and personal gnosis, and comparing personal experience and gnosis with friends of mine who work with the Vanir primarily. EHS: Did your research uncover anything surprising, any odd historical tidbit that you just had to share? S: Right around the time I was doing research for the book, a discovery was made of a rock carving from the Funnelbeaker/Ertebolle era, in Denmark, of a very phallic figure with a horned headdress carrying fishes. It struck me as being an earlier version of Frey, and confirmed a lot of what I was finding about a very Vanic ‘feel’ to that period of time. EHS: Visions of Vanaheim includes contributions from a variety of people. Did you put out a general call for submissions, or did you have specific contributors in mind? Were you surprised by any of the pieces you received? S: I put out a call for submissions and it was a nightmare. The first six months or so I got nothing, then submissions started trickling in. I will never be doing an anthology again. As far as the material I received, I can’t say I was really surprised with anything I got, as people wrote to me and told me what they were sending and asked if that was okay. I was surprised with the quality, though — I found a couple of pieces to be particularly well-done, most notably the section on ‘Vanic Runes’ and some of the poetry. EHS: Visions of Vanaheim includes rituals in honor of Njord, Nerthus, Freya, Frey and other Deities. How did you go about designing these rituals? S: Trial and error. 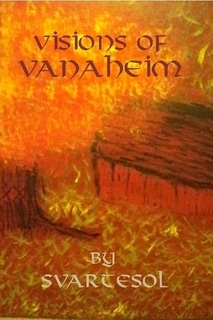 At the time I wrote Visions of Vanaheim, I was working in a more reconstructionist Anglo-Saxon format. The rituals follow some reconstructionist conventions, but I also added some bits from my gnosis and sense of aesthetics. My own personal approach to ritual has changed significantly since then, but people still write to me and tell me they enjoy doing the rituals in the book, so I’m happy it works for them; it worked for me at the time the book came out. EHS: What resources (books, journals, websites, discussion lists, et cetera) would you recommend to someone interested in the Vanir, and in following the path of a Vanatruar? S: There’s a Vanatru discussion group on Yahoo with varying traffic; I am not on this list (I don’t have a lot of time for e-lists), but a friend of mine moderates it. And a collection of Vanic blogs, which is still being updated. Beyond that, I would recommend people check out the books offered by Gullinbursti Press, and that’s about it; there’s really not a whole lot out there on the Vanir or on Vanatru, to be honest. There are far fewer of us than there are Asatruar, so what resources exist are few and far between. However, this is changing, gradually, and it’s important to me to help make that change. EHS: You published Visions of Vanaheim under the Gullinbursti imprint, through Lulu.com. How did the name Gullinbursti come about, and why did you go through Lulu? S: Gullinbursti Press was named for Gullinbursti, my patron God Ing-Frey’s boar. It literally means ‘Golden-Bristles’. From Skaldskaparsmal: “…to Frey he gave the boar, stating that it would run through the air and over seas, by night or by day, faster than any horse; and never could it become so dark in the night, or in the worlds of darkness, but that it would be light where this boar was present, so bright shone his bristles.” As Frey’s boar shines in the dark and moves swiftly over the land, we hope to be a light in the darkness of the void of information, and give guidance and inspiration. Gullinbursti Press has published several books now, and not just by me: we’ve taken devotionals for Skadhi and Nerthus through other people, and I have someone sending me a devotional for Cernunnos at the end of the year. Another person is working on a trilogy of books on Vanic theology and ritual. I help with editing and formatting, and cover art as needed. So we’re a small imprint, but thriving. As far as going through Lulu, there are a couple of reasons. One is that regular Pagan publishing houses won’t take things that won’t sell, and niche material will not sell beyond a niche audience. Yet a need for it exists. Beyond that, creative freedom is important to me, and it’s nice to get revenues without a middleman. EHS: What advice can you offer someone who is considering self-publishing? Things they absolutely must do, but also mistakes to avoid? S: You absolutely must familiarize yourself with desktop publishing. You can create a .pdf through Open Office, which is free. Learn what fonts and what size of font works functionally and aesthetically, and you should be competent enough with spelling and grammar that you can catch things that spellcheck will not. Having learned this the hard way, you should also have someone other than yourself look at the manuscript at least once before uploading it, so they can catch any errors you missed. Self-publishing can look pretty professional if you know what you’re doing. If you are doing an anthology with a general call for submissions, expect a headache. Visions of Vanaheim went four months past deadline because one of the contributors pulled out at the eleventh hour and I had to chase several other people down and nag them about release forms. No matter how much you tell people ‘I need this release form by this date’, there will always be people who hold it up. Pagan Standard Time — it’s not just for rituals anymore. As far as mistakes to avoid, I would simply suggest that you cannot self-publish a book and never promote it and still expect it to sell. How much self-promotion is up to you. Some people do the book tour thing, some of us don’t. At the very least, I would advise a self-published author to have their own website where they can showcase their books for sale, and to ask friends to get traffic there by word of mouth. EHS: What other projects are you working on? S: I just finished An Introduction to Vanatru, co-authored with my friend Nicanthiel Hrafnhild, which is a 32-page booklet meant as a very brief overview of the religion. It is for those who don’t want to sit down with 500+ pages of Visions of Vanaheim, but would still like to learn more. Currently, I’m on a hiatus from writing books, although I will still continue to write essays for my website and post to my blog as inspiration strikes. I expect to do at least one to two more books in my lifetime, as well as edit and format what others send me for Gullinbursti Press. I’ve been focusing less on writing and am getting back into art, which has been a lifelong passion of mine, and which I find deeply rewarding. EHS: Which book fairs, conventions, festivals, et cetera will you be attending in the foreseeable future? S: I don’t do those. I’m very much an introvert and don’t like crowds. I hold a public Lammas ritual for Frey each year, and I occasionally attend local meetups and drum circles, but that’s about it, nothing major. EHS Is Closed to Submissions! Eternal Haunted Summer is closed to submissions. The theme for our upcoming issue is The Dark Spirits of Winter, which will go live on the Winter Solstice. Submissions for the Summer 2019 issue will open 1 May 2019. EHS Is Now On FaceBook! Come on over and join the conversation! Discuss the recent issue, post your own reading recommendations, and more. One of our proud sponsors!